It's no secret that I lurve me some football. I saw this post and was inspired to do my own outfits based on football uniforms. 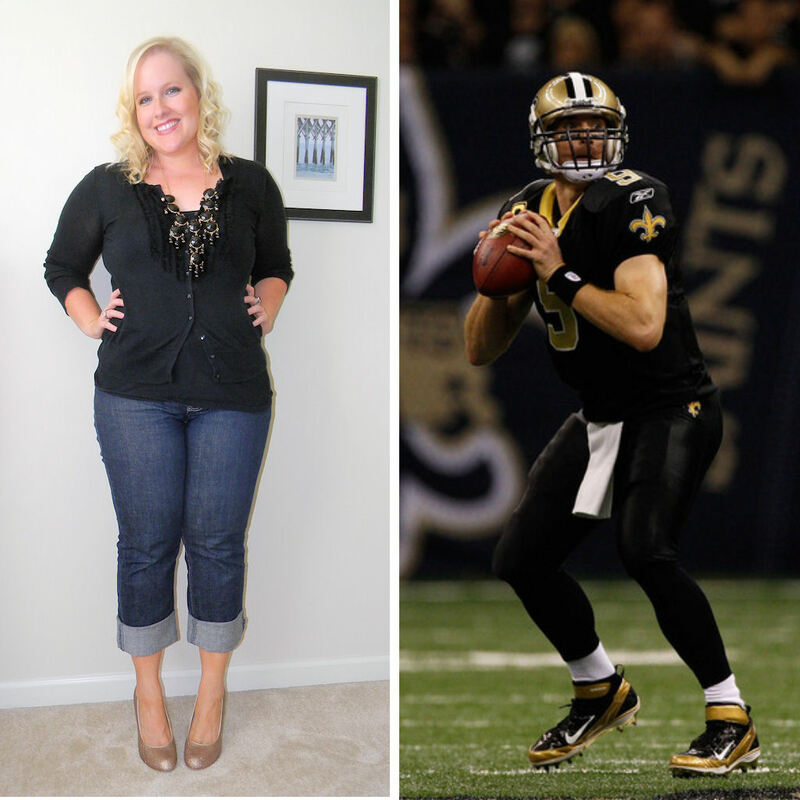 Basically, I wanted to show ways to represent your fave team without necessarily wearing a jersey or t-shirt. Because this girl likes to look good...especially when she's watching her man play. 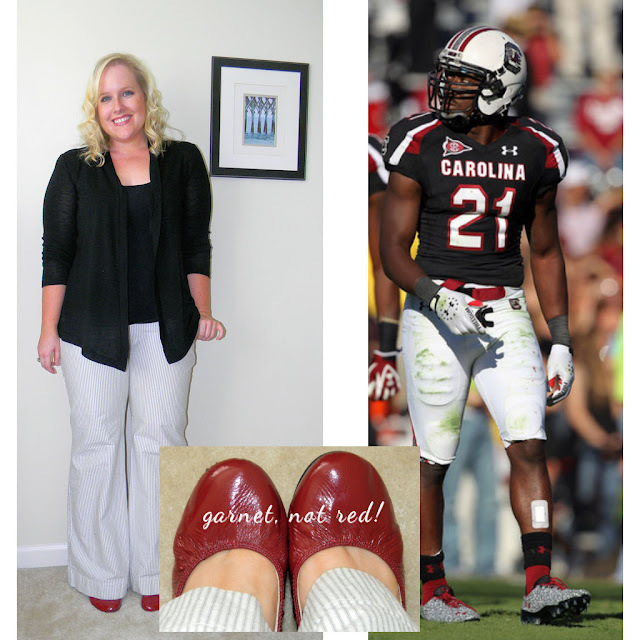 I'm rocking my garnet, black and white just like Marcus Lattimore of my beloved Gamecocks. Notice that my shoes are GARNET and not red. There is a difference, believe me. Garnet is darker than true red. And true red would make our colors just like those of the enemy, so we roll with garnet. I did white and gray pinstriped pants with black on top. I wish I had a garnet colored statement necklace. Y'all be on the lookout for one, okay? I am a fan of the Tebow. He's such a stand-up guy, you know? He really seems like he's got his head on his shoulders even IF he played in Florida. Also, he has a tendency to play for teams with blue, orange and white team colors. Weird? Well, I tend to like this combination. 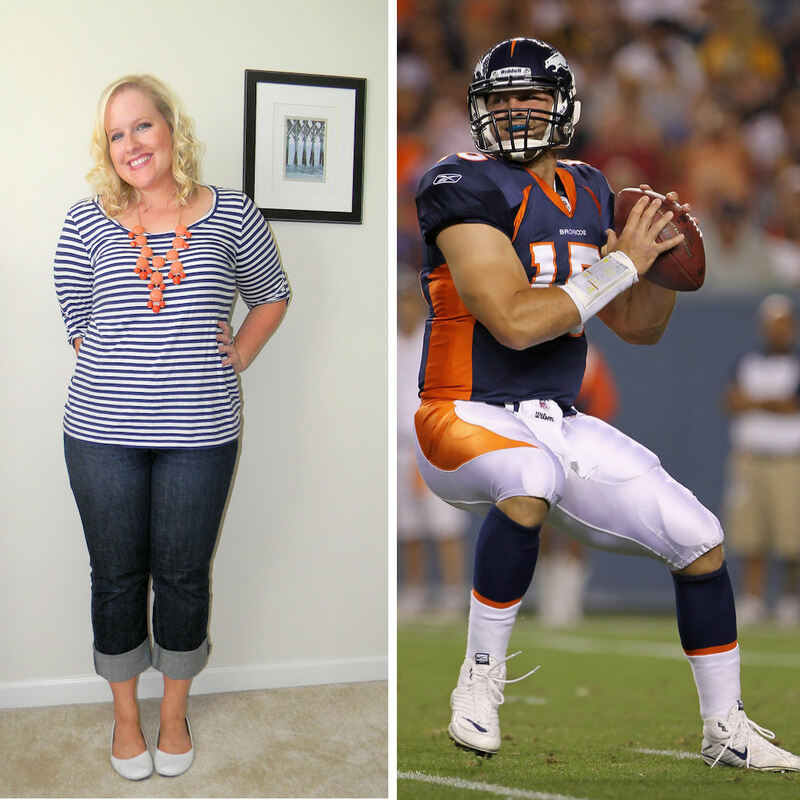 Navy and orange is such a classic combo that I had no problem finding an outfit to interpret the Denver uniform with. I know what y'all are thinking...did she really just go there? Did she really just do outfits based on football. I really have no way to end this post, so, urm... how about a little eye candy to end it? LOL- I enjoyed this post about football. I love watching football even though I don't have a favorite team... I guess my team is the team "cute, muscular men wearing tight pants"
Heh, I like the way you think! This. Is. AWESOME! I live overseas and college football is one of the things I miss the most. Might have to work on some similar outfits for my schools.. too fun! Oh, I love it! Way to show some spirit sans jersey! I think the Broncos one is my fave!!! This is a perfect post for you. That is all. Did you ever watch Gilmore Girls? There was an episode where the girls went to a Harvard/Yale football game and Lorelai (the mom) wore crimson (Harvard color) even though her daughter was a Yalie. There was a whole discussion about whether she was wearing crimson or just red. Your garnet shoes reminded me of it. Can. Not. Wait. For. FOOTBALL. Your outfits are adorable and super-festive. Thanks for sharing! Girl you have some Style!!! :)! Thanks Jamie! I actually went on their website and they have some really cute stuff online that is garnet. :) Thanks for the suggestion!